But now I’m back at long last. 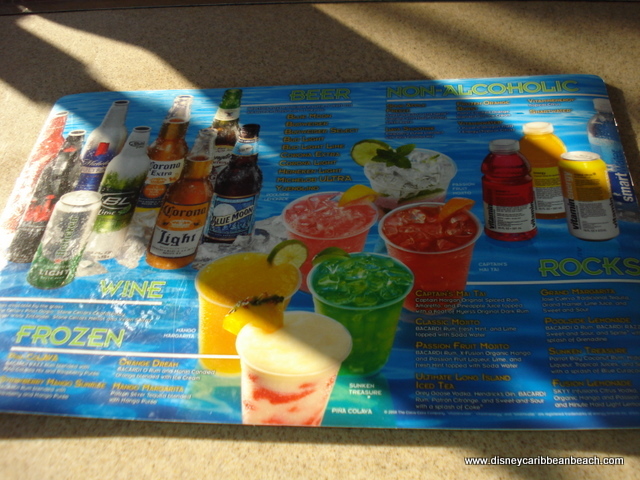 Welcome to the Banana Cabana Pool Bar at Disney World’s Caribbean Beach Resort! 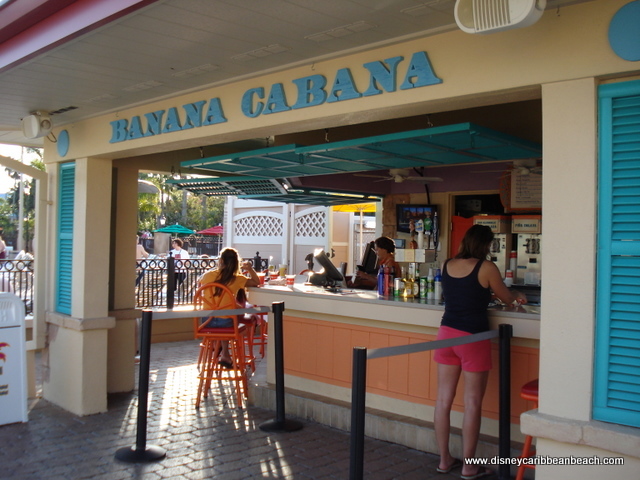 Banana Cabana may not be new and flashy like some of the more recent watering holes to arrive in Disney World like AbracadaBar or Trader Sam’s Grog Grotto. 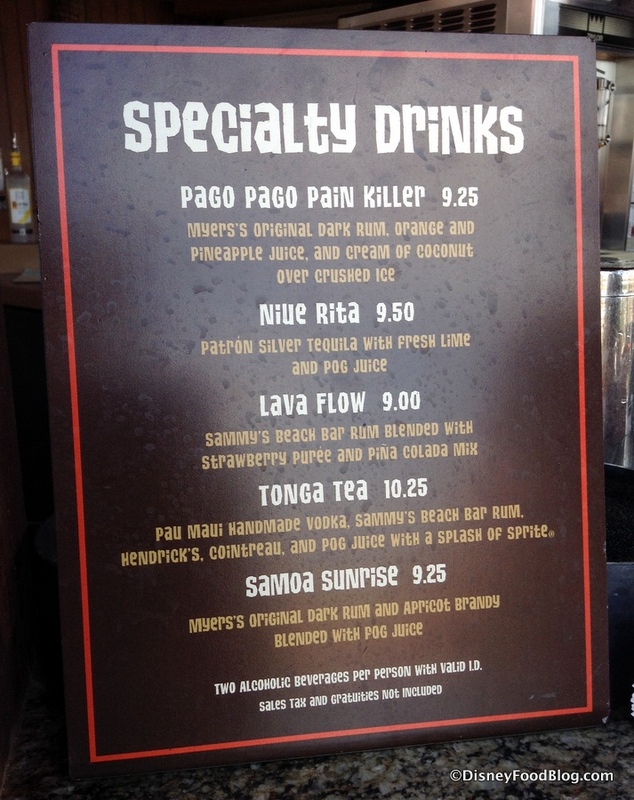 And the still relatively new Oasis Pool Bar is delivering some brag-worthy eats to guests at Polynesian Village Resort. 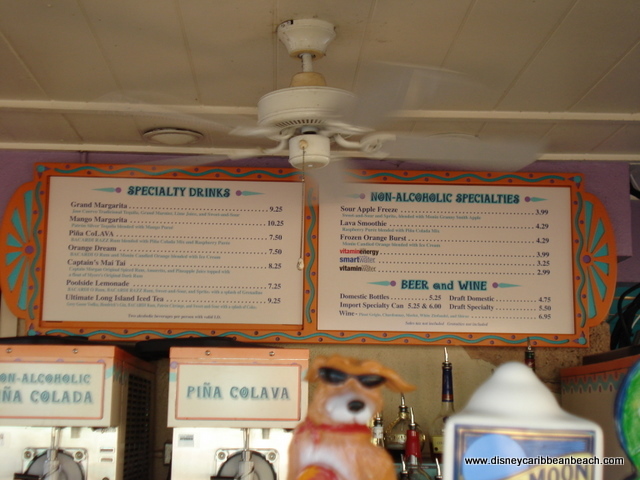 But Banana Cabana has long held a place in my heart because of its tropical vacation vibe and terrific bartenders. Banana Cabana is a mini-getaway in and of itself, even within the Vacation Kingdom. 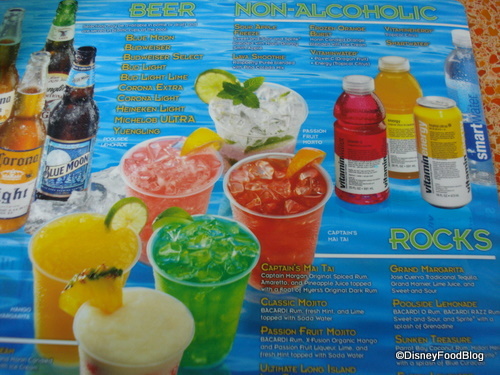 So join me in kickin’ back with a few drinks by the pool at Banana Cabana! Well, wouldn’t you know it? Well, that’s not entirely true :). 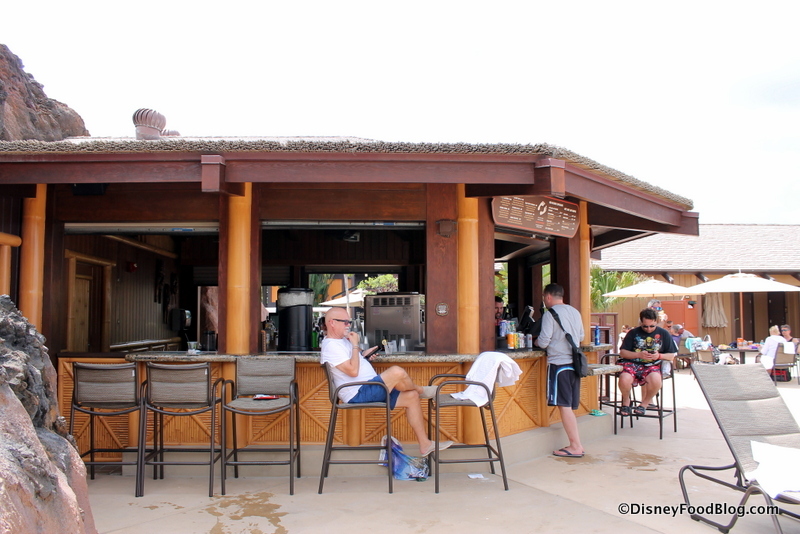 Everything you could previously purchase at the Barefoot Pool Bar is still available (that means the pool bar standards like the Captain’s Mai Tai and Banana Cabana). In fact, they’re all still prominently listed on the main menu. But, lo and behold…. 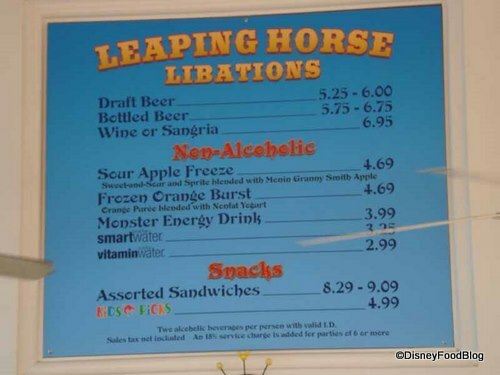 just days after my visit, I heard about some all-new (and if I understand correctly, mostly exclusive) drinks at the Barefoot Pool Bar! You can spot the descriptions on a stand-up sign, and fans of the Polynesian will get a kick out of reading the well-themed drink names as much as the descriptions with titles like the Pago Pago Pain Killer, Niue Rita, Lava Flow, Tonga Tea, and Samoa Sunrise. Just click on the image below to enlarge and read the item descriptions. I love that the Samoa Sunrise features POG Juice! I didn’t see this menu at all on my previous visit, but whether that’s because they were not being served yet since the pool bar had just reopened or I’d missed the roving sign, I’m honestly not sure. 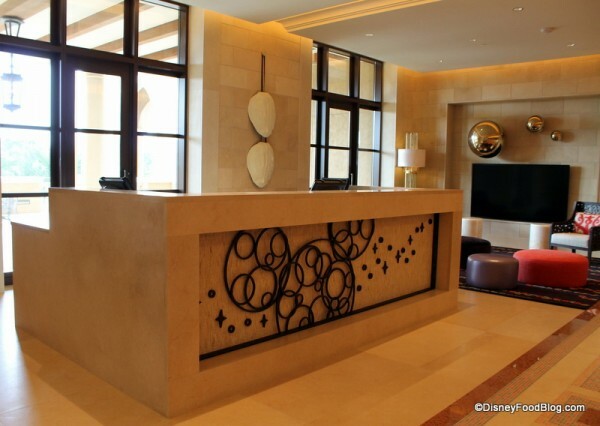 Opening August 3rd, Four Seasons Orlando says they will provide a best-of-both-worlds vacation experience: “easy access to all the area entertainment in a tranquil setting,” at Golden Oak in Walt Disney World, according to Thomas Steinhauer, Regional Vice President and General Manager. When it comes to Disney World, bars and lounges aren’t just adults-only destinations — and they don’t just serve drinks. In fact, here’s a Best Kept Secret in Disney dining planning — Disney bars and lounges can be great places to get a meal with the whole family. 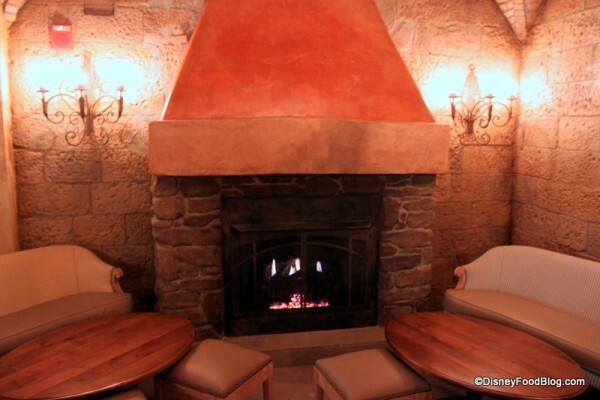 These hidden gems are often less crowded than standard restaurants, too! 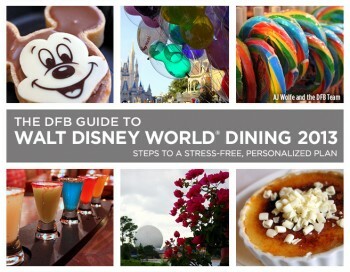 In The DFB Guide to Walt Disney World® Dining 2013 e-Book, we have an entire section reviewing every single bar and lounge in Walt Disney World. It’s well worth a read to find out great spots to get a full meal or a snack — even with no Advance Dining Reservation! 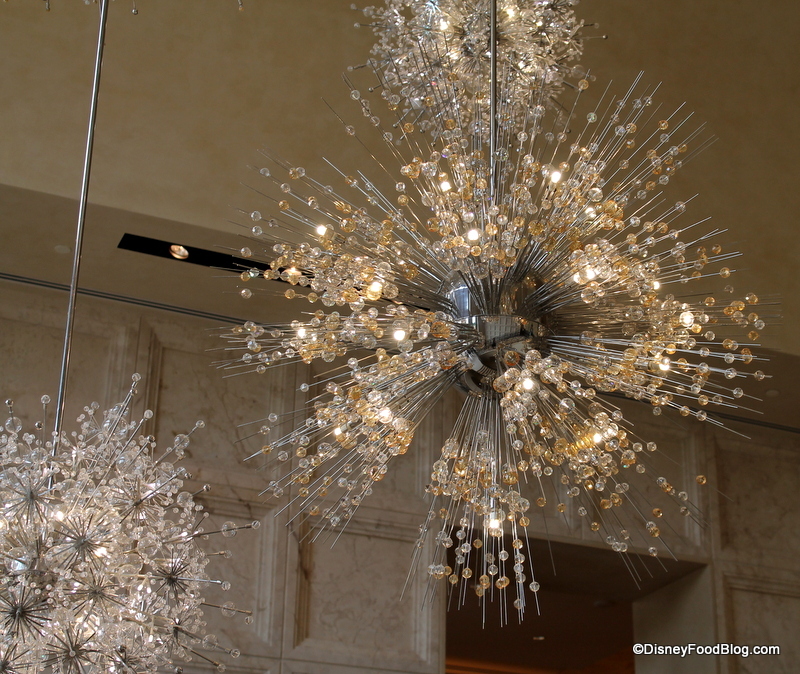 A Disney World trip can be hectic (meeting characters, dashing to attractions, and racing off to dining reservations! 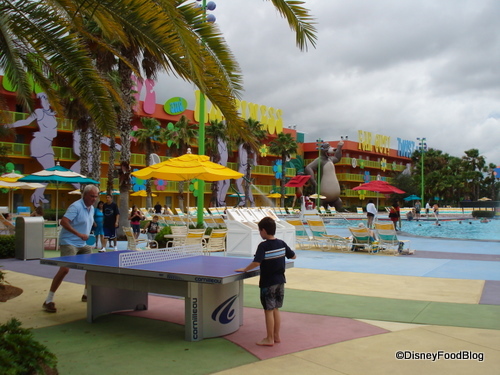 ), so finding a place inside the parks to escape the hoopla is key to a relaxing vacation! With signature cocktails, cheese plates, fondue, burgers, donuts, pasta, and more, you’ll find some truly inspired menus at Disney World’s bars and lounges. 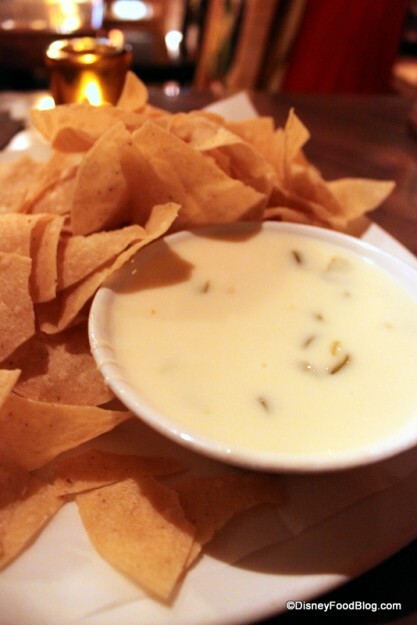 Sometimes you’ll even be able to order from the full menu of a nearby restaurant. In Epcot, we can highly recommend stopping in to Tutto Gusto in Italy, Rose and Crown Pub in the UK, or La Cava del Tequila in Mexico. At Tutto Gusto, order from an awesome menu of meats and cheeses, paninis, pastas, and more. A relaxing atmosphere and full tables allow for an easy meal for the whole family. 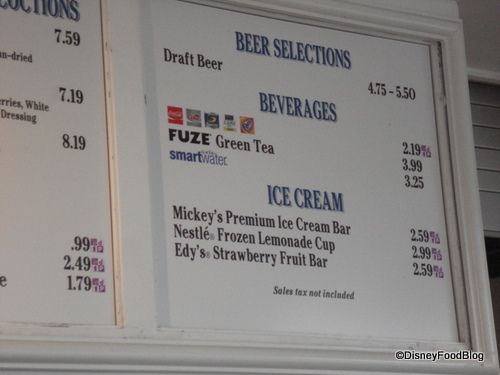 Rose and Crown Pub, attached to Rose and Crown Restaurant, features a fun menu that — gasp! — the kids might even like! 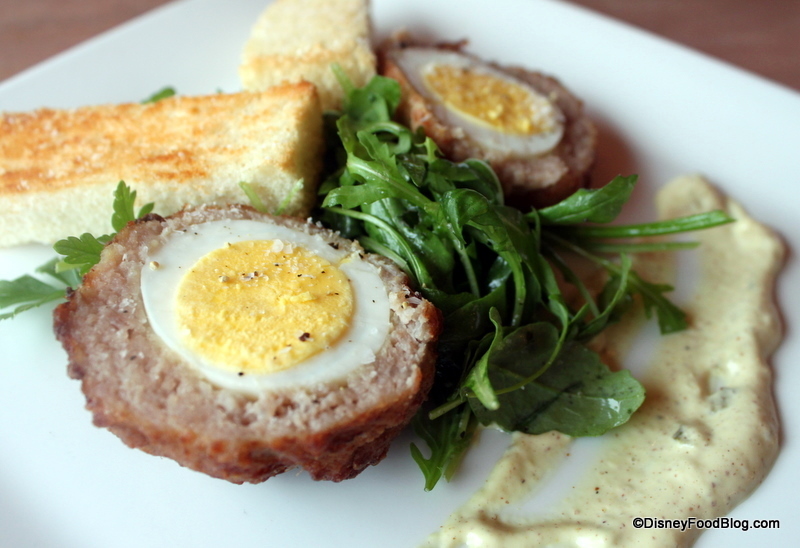 We can highly recommend the Scotch Eggs and the British Bulldog sausage (see our review of the British Bulldog here — and the photo at the top of this article)! If you’re there on a weekday, seek out Carl the Bartender and ask him to show you his amazing magic trick! At La Cava del Tequila, sample a few Mexican appetizers like chips and salsa, queso, and guacamole along with your margaritas! 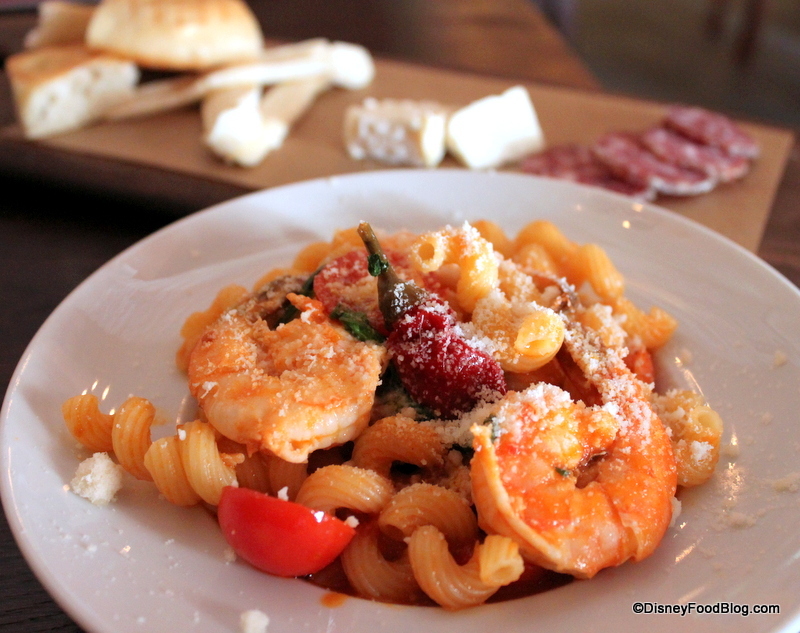 Another favorite place to unwind in the parks and get a great meal is at Tune-In Lounge in Disney’s Hollywood Studios. 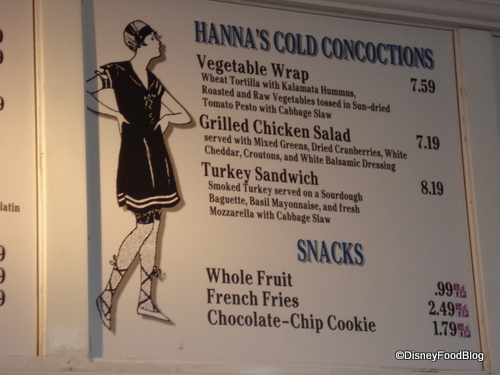 What Disney Dining Spot Would You Expand or Change? I think we can all agree that Disney parks and resorts are pretty great places. Still, I can always dream up ways to make them better… . 😉 After all, I did make my case for an Automat, right? 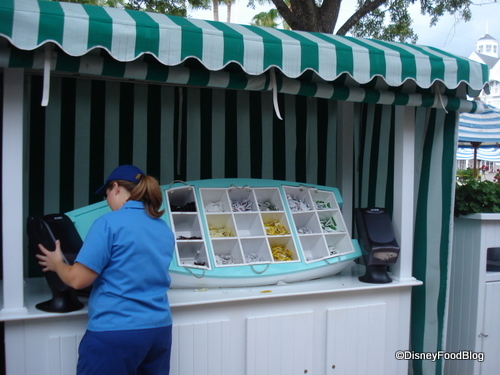 No automat yet, but I’d like to share another change that I’d love to see made: an expansion of the Banana Cabana pool bar at Disney’s Caribbean Beach Resort! 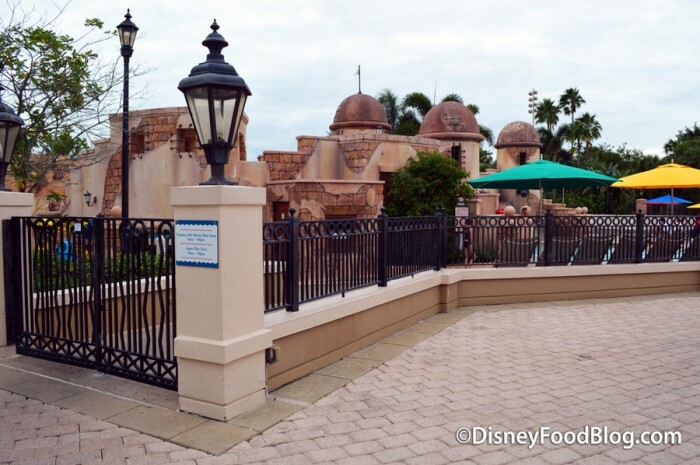 I’m including my thoughts on this below, but I’d love to hear YOUR ideas on what Disney World dining spots could use changes — whether they’re menu updates, expansions, or something else! Dream big — what would you do with an unlimited budget? Disney World, Disneyland, etc… everything’s on the table. My Suggestion: Banana Cabana Expansion! For my first joint project with Walt Disney World as a consultant for development (ha ha! ), I’d make this fun and always-hoppin’ pool bar a little bigger! Located adjacent to both the fabulously-themed (PIRATES!) 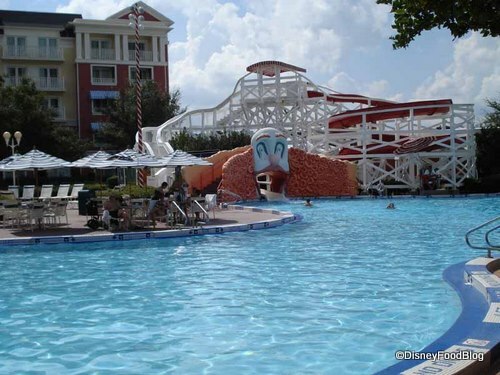 main pool and the Old Port Royale shopping and dining mecca, Banana Cabana is the perfect place to grab a drink, keep an eye on the kiddos while they hang out in the pool, and watch the sunset. Disney’s Boardwalk Inn is themed after the vintage northeastern boardwalk resorts popular in the early 1900s. 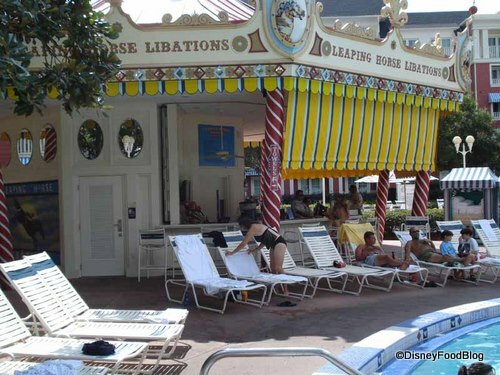 “The Clown Pool” is its carnival pool, with Leaping Horse Libations serving as the centerpiece carousel. 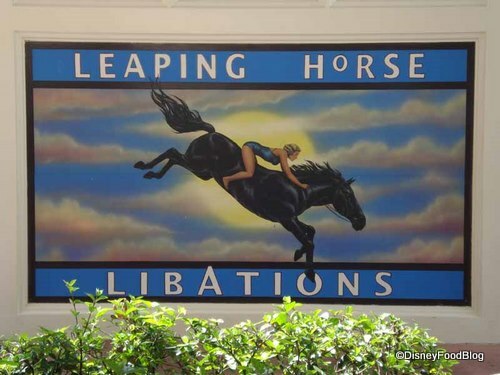 You can clearly see in the structure that it’s made to represent a carousel, and the “leaping horses” in the name are the carousel horses, of course! 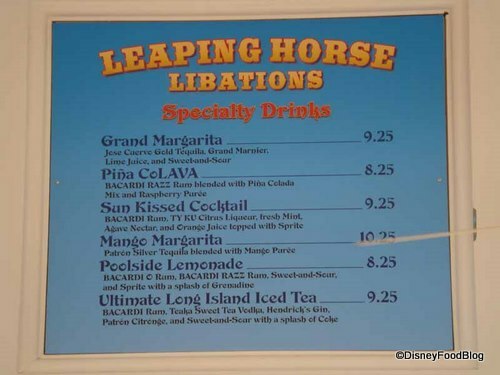 While Leaping Horse Libations doesn’t have an extensive grill or food menu like you’d find over at the Yacht and Beach Clubs’ Hurricane Hanna’s, it does have a yummy drink menu, and you can purchase snacks. 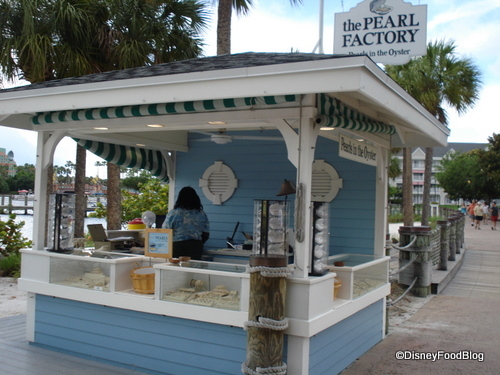 And don’t forget that you’re not far from some delicious dining options on the Boardwalk. 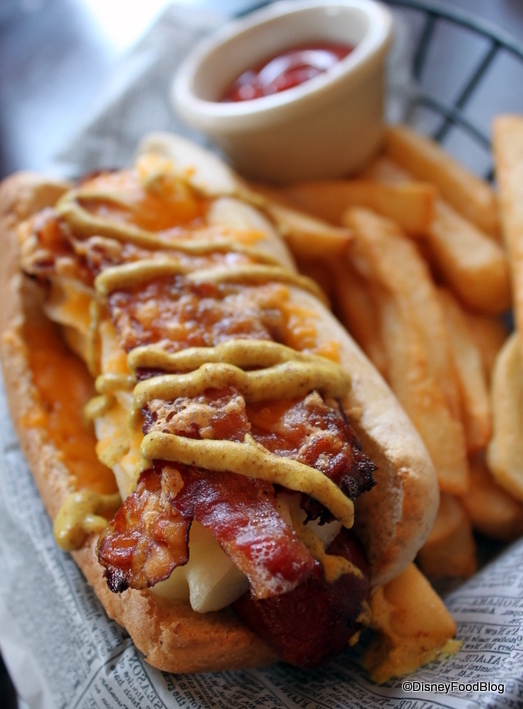 Straight from the pool, you can always head over to Kouzzina, Flying Fish, ESPN Club, the Boardwalk Bakery, or just over to the hot dog cart (a chili dog always sounds good to me after a long afternoon in the pool…how about you?). I’m not sure about you, but a fruity drink in hand, a thatched roof over my head, and a few flamingos frolicking in the background is just about all I need on vacation 😉 If that’s your dream come true, you can have it! Even the flamingos! Just stroll out to the Uzima Springs Pool Bar at Animal Kingdom Lodge, Jambo House. Besides the thatched roof and generous umbrella-ed seating, what makes this spot so enticing is the enchanting themeing around the pool. 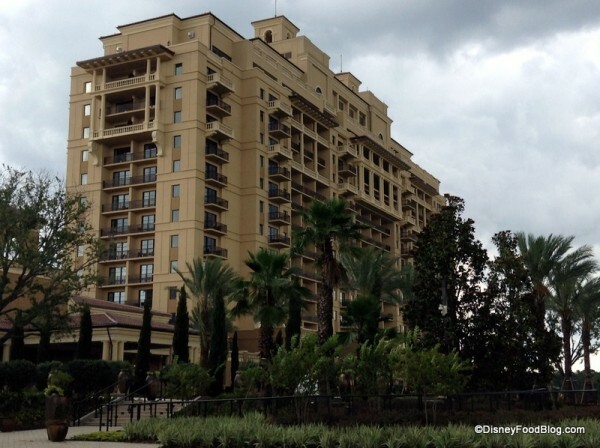 Animal Kingdom Lodge is one of Disney World’s best-themed resort hotels, without a doubt. From the indentations of leaves, brush, and children’s footprints in the red dirt-tinted cement, to the whirlpool spas hidden by foliage, to the numerous savanna ponds scattered around, the Uzima Springs Pool area is a jungle of fascinating imagineering touches. Even if you’re just there for a drink, it’s impossible not to go peek behind that grove of trees or jagged fence to see what treasures (and you KNOW there are treasures) lie beyond it! The place is a mini-theme park in itself. Behind Curtain Number One...A Whirlpool Spa! Behind Curtain Number Two...Hakuna Matata Playground! Although we’re having fun exploring the pool grounds, let’s head back to the bar! In addition to the ubiquitous Disney Pool Bar standard menu, Uzima Springs Pool Bar also features some wonderful African beers and South African wines. And don’t forget, they’ve still got that rolodex of old recipes back there, too; if there’s something you’re pining for, be sure to ask! And once you have your delicious bevvy, head over and find those elusive flamingos! Thanks to AKLResort.com for contributing photos for this blog post! Also, quick reminder — there’s no pool hopping to Uzima Springs, so although you can visit the pool and get a drink, don’t swim unless you’re an AKL guest. 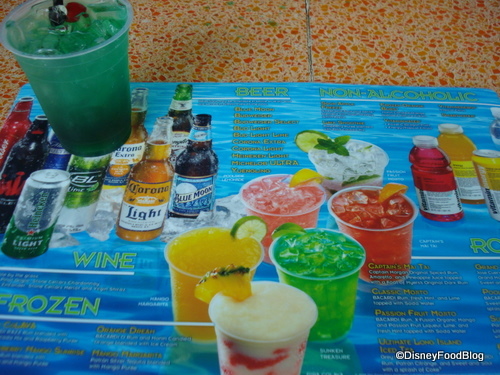 I’ve mentioned on the food blog before how much I enjoy Petals Pool Bar at POP Century Resort, and I thought it’d be fitting to dedicate a colorful TGIF blog to this great place. Again, there are some truly wonderful bartenders here (I don’t know how Disney finds so many of these top notch CMs), and Petals rivals Banana Cabana at Caribbean Beach Resort, Uzima Springs Pool Bar at Animal Kingdom Lodge Jambo House, and Trout Pass at Wilderness Lodge for my “favorite folks” award. 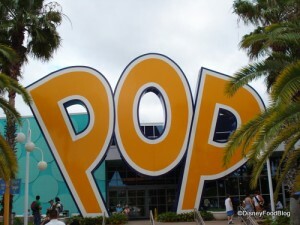 POP Century Resort is themed around the pop culture of the past half century, and giant, two- and three-story icons represent nostalgic items and characters from the 50’s, 60’s, 70’s, 80’s, and 90’s. Petals is located at POP’s Hippy Dippy Pool, which is shaped like a giant flower and plopped down in the center of the two 1960’s buildings. This is the resort’s main pool, situated right behind the building housing the lobby, food court, and gift shop. 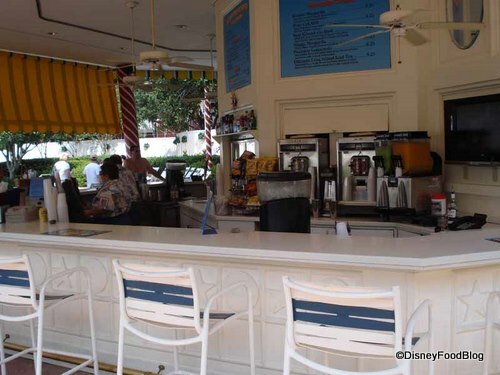 I really like the ability to stop into the food court or gift shop to get any items that might be needed, then stroll outside to grab a cocktail and have a seat in the shade. Because the pool is so close to the main building, you really don’t feel out of place having a cocktail at the pool bar when you’re not swimming. 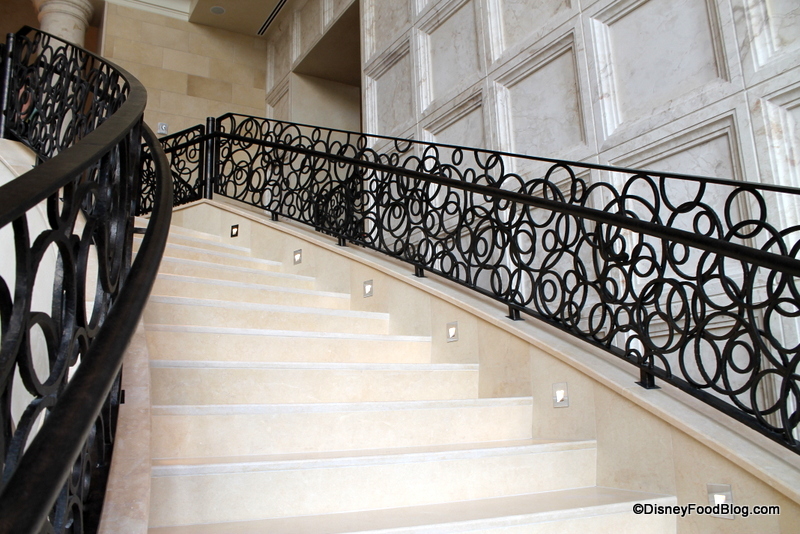 This is a great feature at value and moderate resorts, which don’t have indoor lounges. 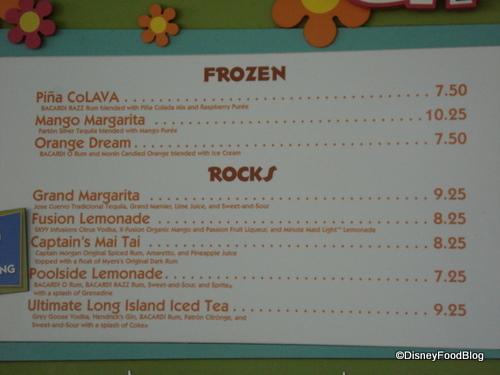 There are no food offerings at Petals, but there’s a good variety of frozen, on-the-rocks, and non-alcoholic drinks. 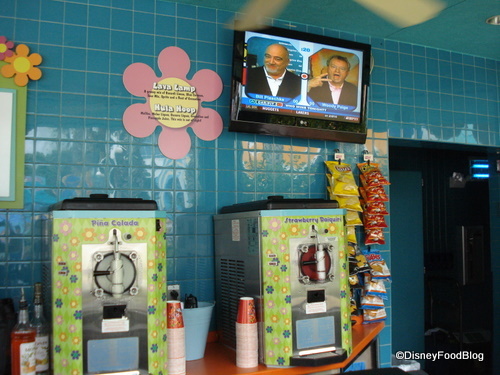 If you need something to nosh on, just pop into Everything POP Food Court for a snack, and bring it back out to the pool area! 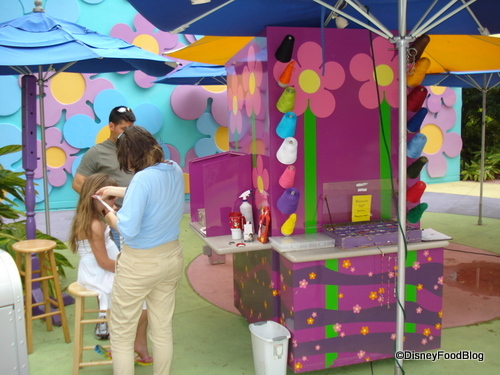 Once you’ve settled in with your drink, pass the time by watching a ping-pong match on the nearby table, or ponder which Disney tattoo or hair wrap you might treat yourself to — those kiosks are just across the pathway from Petals! Overall, Petals is a great place to comfortably relax. 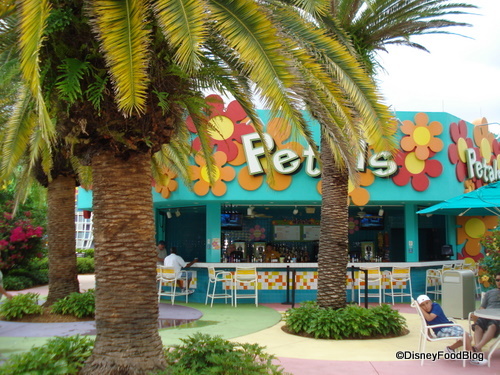 Even when I’m not staying at POP Century, I love popping by the resort for a bite to eat in the food court (one of the best on property in my opinion) and grab a drink at Petals. Good drinks, good people. I’m a big fan. 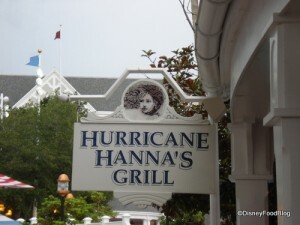 After a truly amazing recent stay at the Yacht Club, I really wanted to share some info about Hurricane Hanna’s as the second installment of the Pool Bars series. 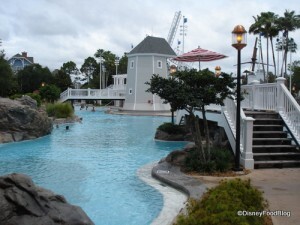 This is the pool bar for Stormalong Bay, that mini-water-park nestled between Disney’s Yacht and Beach Club Resorts. I’ve spent many lovely afternoons lounging by this pool, taking advantage of the super-duper long shipwreck slide, and greatly enjoying the poolside service by Hurricane Hanna’s waitstaff. But even though you need a wristband proving that you’re staying at Y&BC to swim in Stormalong, you can visit Hurricane Hanna’s even if you’re not a resort guest! Strolling on the Boardwalk? 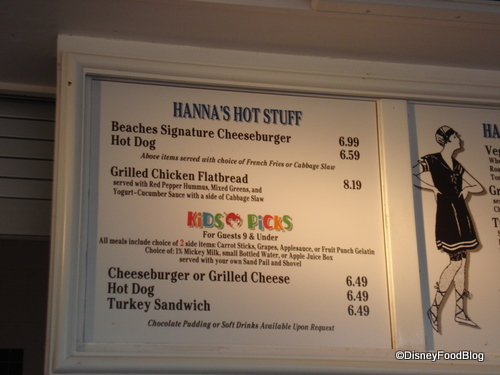 Head over to Hanna’s for a hot dog or a Mai Tai! 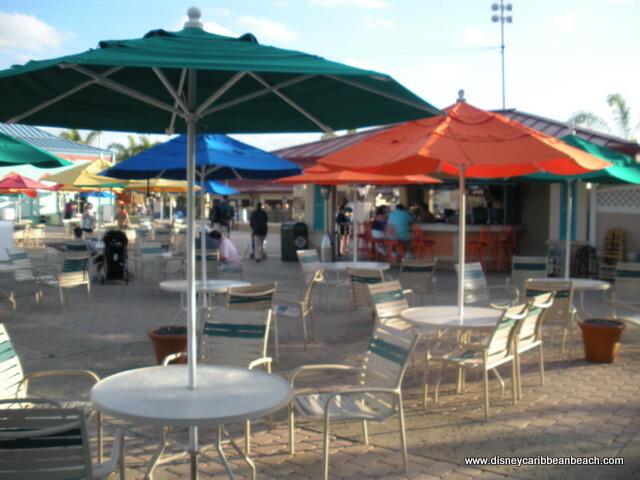 There are several tables with umbrellas available for guests to sit and relax. 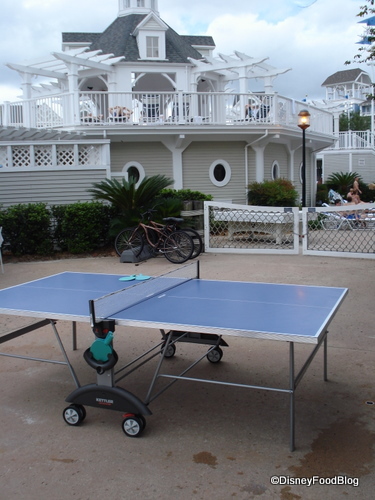 Don’t forget that you can pop behind Hanna’s and play some ping pong! 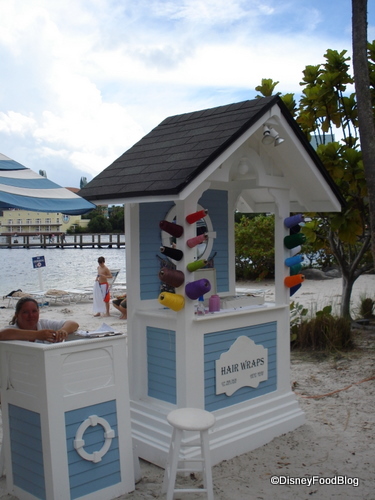 If you’re not at the pool, pop over to the Yacht Club beach to get a hair wrap, pick a pearl, or just relax on a lounge chair. 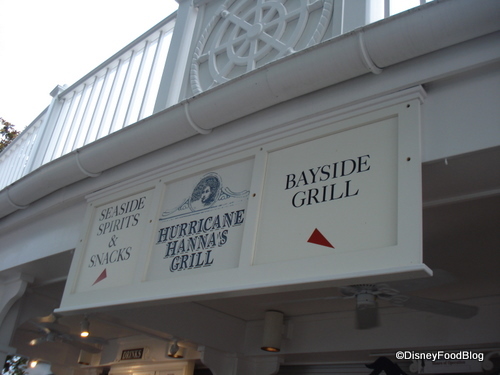 Hurricane Hanna’s, because it’s situated properly to be rather available for use by those just visiting the Boardwalk, is definitely one of the more accessible pool bars on Disney property. It’s also a great way to grab a glimpse at the largess of Stormalong Bay! 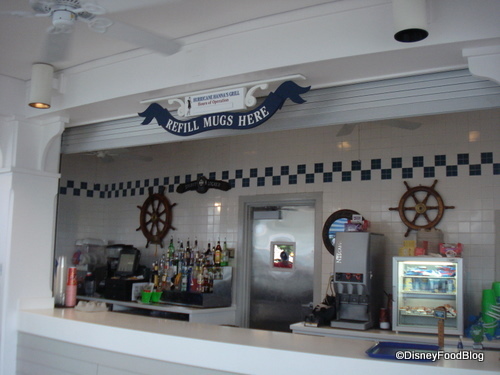 The next time you’re out and about between Epcot and Hollywood Studios, take a stroll over to the Yacht and Beach Clubs and enjoy a nice, relaxing beverage on the beach. You’ll thank yourself! 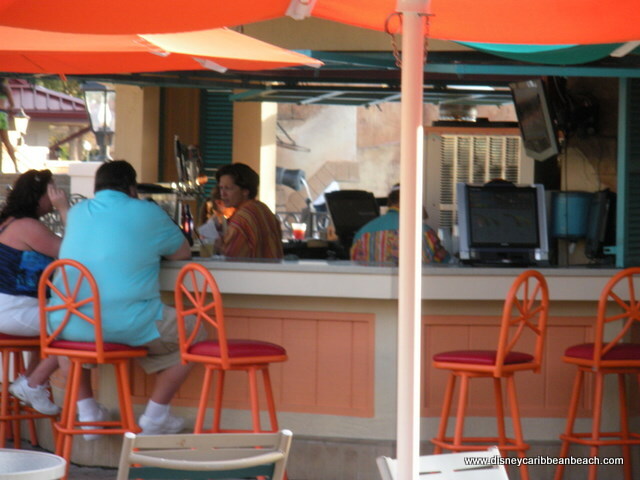 I’ve long wanted to do a series on pool bars, and Brad over at DisneyCaribbeanBeach.com tribute website has kindly offered the photos for me to start! Banana Cabana holds a special place in my heart as it’s always so relaxing, and I continuously find the kindest and most engaging bartenders there! 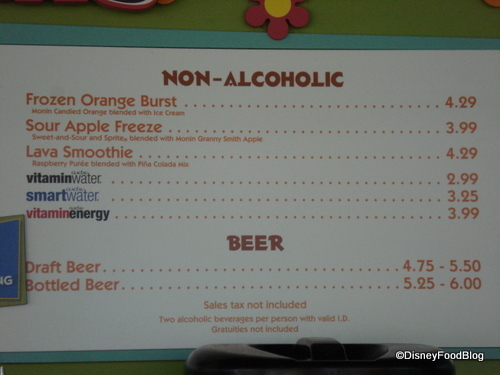 And, as all Disney World pool bars do, Banana Cabana serves the standard Disney drinks as well as a few of its own special concoctions! 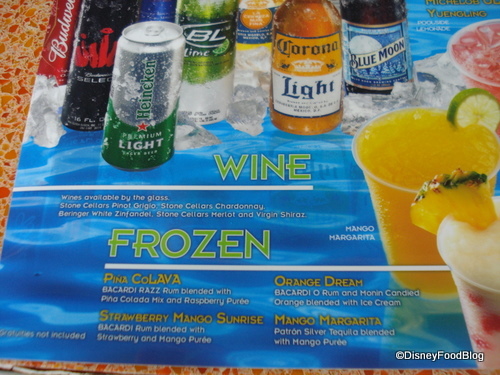 Indulge in mixed drinks, frozen or on the rocks; all servings of bears; wines; and non-alcoholic drinks — including a non-alcoholic pina colada! When you get a bit peckish, just head inside Old Port Royale to the Market Street Food Court and visit one of the several food court locations for a bit to eat. This is a great place to watch the sunset, keep an eye on the kids in the (AWESOME!) theme pool, or just enjoy some time with your friends and family on vacation. Sit back, relax, and take in a little of that caribbean calm! What’s YOUR favorite pool bar? I’ll add it to the list for the series! Let me know via facebook, twitter, or email!